Whose “Place” Is it Anyway? I have just finished a terrifically positive, inspiring conversation with Ethan Gelber, co-founder of the Local Travel Movement in which we recognized that the essence of his movement and Conscious Travel is the same. All travel purchases are made locally even if the benefits do not always stay there. Travel is motivated by the differences that exist between origin and destination – we travel to see somewhere different than home. As the industrial model tends, over time, to standardize and homogenize, it contains within it the seeds of its own destruction. The Local Travel Movement is one path towards celebrating what makes a Place unique and scarce and, therefore, more valuable to guests and generate a higher return to hosts. Conscious Travel focuses on supporting hosts in celebrating and differentiating their “PLACES” as this is the only way in which they will be truly valued and can return real net benefit to all. Not long after putting down the phone, my attention was drawn to the plight of the Cinqueterra. This beautiful part of Italy appears under threat from a minority of its own locals. A local population of some 5000 residents is responsible for protecting what has been recognized as a world heritage site from the greed of a few “locals” who wish to tap into short term income associated with 3 million visitors. Years of work associated with revitalizing local crafts, developing local food and crafts and the creation and maintenance of a National Park have been halted. The region’s economy has suffered from the recession (caused largely by greedy bankers located miles away) and flashflooding. It seems that a little tourism can be a good thing – when I visited the area in 1969, the villages were poverty stricken and in a state of dilapidation. A tourism industry provide the economic rationale for their restoration. But too much tourism can be harmful. More is not always better. Two communities, Vernazza and Monterosso along with the mountain paths that connect the five communities, were severely damaged in the storms of October 11th. While tourism activity was negatively affected, some also cite tourism along with climate change as a cause of the damage. Regular mantenace of the terraced hillsides has lagged as residents turn to more lucrative and less onerous occupations than farming. In 1951, about 3,500 acres were cultivated in the Cinque Terre. Today, there are fewer than 275. I write this post in the hopes that my readers will share the link to the source of the video below. 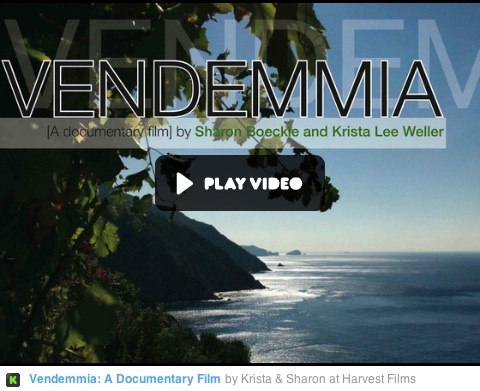 Film makers, Kristie Lee Weller and Sharon Boeckle of Harvestfilms, who had already chronicled the revitalization of the local economy, are seeking to raise $2500 to film the current conflict and draw attention to the issue. Click here to see the film and here to read their blog. The second reason for writing is to open up the conversation regarding the question: whose place is it anyway? Do non-residents like me and the American film-makers have the right or a responsibility to influence local opinion and show we care? If a place can be recognized as being of global significance, what safeguards and support can and should be given to local communities to protect that which is deemed as scarce? The opinion broker, AVAAZ, has been effective in demonstrating that a global community can influence, even determine what happens in a locality. How does that fit with an ethos of “self-determination” when local preference might be equated with “self-destruction” ??? Note: some of these questions parallel those raised in Andy Jerosz blog Challenges That Occur When You Meet the Locals discussed earlier here. Regardless of your response to these questions, I urge you to help these film makers document the issue and its possible resolution. Given the doubling of tourism (as forecast by the UNWTO), you can safely expect that the Cinque Terra story will be commonplace and we’d better be ready to deal with this conundrum all over the world.